Coinciding with a patch and an expansion, BATTLETECH has been updated for Linux. I’ve spent some time with both the base game and DLC and have come away with a lot to say. 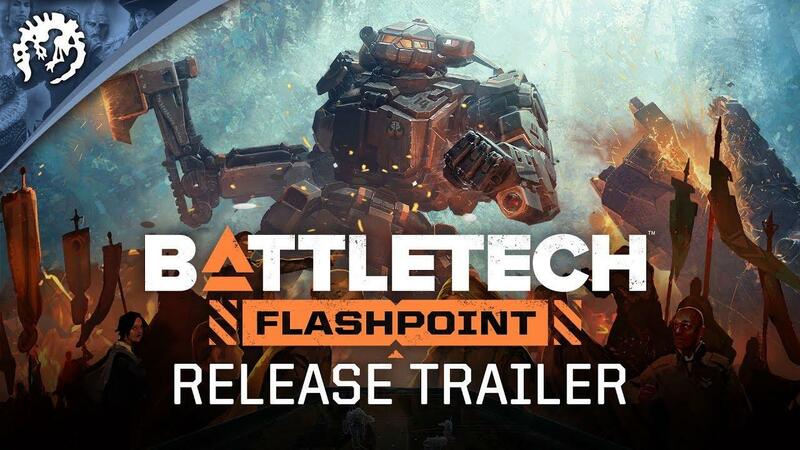 Note: Flashpoint DLC provided by Paradox Interactive and the base game is a personal copy I purchased. 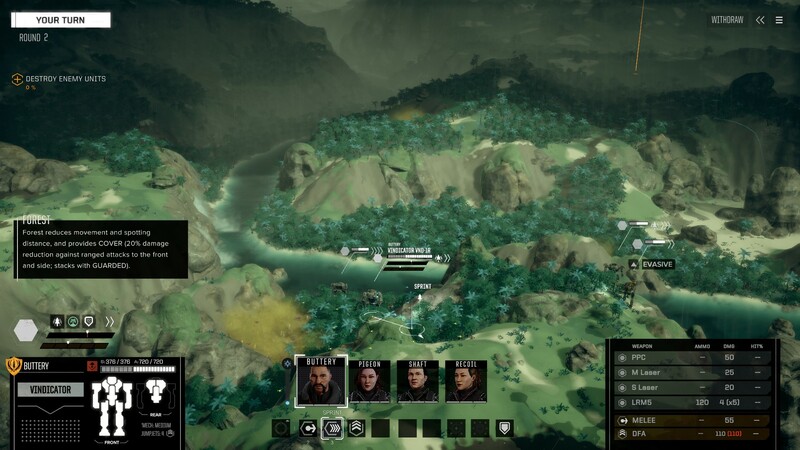 BATTLETECH places players in the role of a captain of a mercenary company in a futuristic setting, going from star system to star system, generally blowing things up and trying to make money. The game was originally crowdfunded and released earlier in the year but the Linux version ended up being delayed until a beta was released just two months ago. The core of the game are the turn-based tactical battles that take place between groups of giant robots. It’s a system that’s somewhat different than most tactical games with a focus on a smaller amount of units and managing things like heat and ammunition carefully. Move order is determined by initiative, which in turn depends primarily on your ‘Mech’s weight class. The in-game tutorial does a poor job of explaining the more subtle mechanics but playing a few missions and reading tool tips carefully was enough to get me up to speed. There’s a whole shedload of ‘Mechs in the game, each within a particular weight class and with a default armament that helps it fulfill a specific role. The game encourages experimentation and swapping out parts and trying different options according to where you’re fighting is important. I’m not a min-maxer by any stretch so I’m not certain if there are combinations that are more powerful than others, but I think that there’s a good degree of flexibility that the game affords you. Pilots can also be swapped out at will and, as they often have different abilities, that can also open up new approaches to combat. Battles can be nail-biting affairs as often your opponents area piloting similar ‘Mechs or may have the advantage of numbers. This isn’t an easy game by any stretch and knowing when to use abilities or when to execute tactical retreats is key to keeping your squad alive. A precise hit on a key system in a turn can often mean the difference between an easy victory or a bloody stalemate. Players like me, who may not be that familiar with the vast catalog with ‘Mechs, might find themselves scrambling for an effective counter when encountering a new opponent. In this sense the game can be a little overwhelming and could use a little more feedback and hints as to the strengths and weaknesses of something you encounter for the first time. Occasionally, some of the randomized missions can be outright unfair. As you always control a maximum of four units, picking and choosing when to fight is important. More than once I had enemy reinforcements trigger after killing another enemy and then spawning in virtually on top of my units. Sure, I understand that an element of random surprise is typical in tactics games, but because most matches are about careful advance and positioning, it can feel frustrating to have that undone immediately. The end result is that the enemy scores free hits on you as you scramble to adjust which always feels cheap in a singleplayer game. Luckily, the multiplayer bouts are balanced and avoid reinforcements altogether. The singleplayer content is split between a tactical skirmish mode and a full campaign/career mode. The latter see you doing much more than just fighting battles as you have to manage your mercenary company’s finances, crew morale, upgrades and the like. I generally enjoyed the story that was in the campaign though it wasn’t exactly a gripping narrative. There’s little random events that may happen while traveling that give the game some more personality and I think does an adequate job showing you what your crew is like. Taking on contracts, allying with factions, discovering parts for new ‘Mechs is all fine and good. However, there are parts to the singleplayer that drag the game down as a whole. I found that the difficulty is uneven and often you’ll need to grind through smaller contracts before being able to take on things that are at your supposed difficulty level. That’s because repair costs as well as replacement modules can easily get very expensive depending on how much damage you’ve sustained. Add to that that your pilots may become injured and it’s therefore important to have similarly-leveled replacements. If you’re a fan of something like XCOM’s Long War mod, you won’t mind this slower pace but those who just want to see all the game has to offer may be at it for at least several dozen hours in a campaign. There’s a lot to love visually about the game. Yes, the models and the textures could stand to be better. I hear you and agree. But the combat animations more than make up for it. Watching lasers fly across a map, a 60 ton robot use its jump jets and land on top of another one, or seeing robotic arms blown off is pretty neat. The sense of scale and destruction you’re unleashing with your units definitely feels right. The levels themselves range from exotic lunar landscapes to very familiar lush forests or hills. Zooming in a little too much can dispel some of the charm but, for the most part, it’s enjoyable to watch the game do its thing. I haven’t really talked about the new content in Flashpoint and there’s a simple reason for that—I haven’t had the chance to play with it as much as I wanted. Most of the content is for experienced and hardened mercenary companies, coming in later in the campaign. As the career/campaign mode is already very long and the new flashpoint content is several dozen hours more, I’ve only just scratched the surface there. That said, I welcome the new types of missions and objectives as it can get a little stale doing the same types of missions over and over. It’s definitely worth getting if you’re already invested in the game and the addition of a new type of map biome, black market stores, as well as three new mechs, are also nice to have. Since its launch earlier this year, the game has gotten a lot of spit and polish. There were complaints about the speed of animations and other tedious things but those have been more or less addressed. Balance issues have also been sorted in a satisfying way. The 1.3 patch that has released today has overhauled pilot abilities and addressed what would have otherwise been a paragraph or two of complaints in this review. There’s even a new “Career” mode that lets players skip the story elements and just work directly at being the best mercenaries they can. While I wish we had had BATTLETECH at launch, there’s certainly something to be said about getting a more polished experience out of the box. BATTLETECH gets a solid recommendation from me despite its persistent issues with uneven difficulty. The core system feels good and there’s clearly been a lot of care put into its worldbuilding. Jordan Weisman, one of the original creators of the tabletop game in the 80s, was in charge of developer Hairbrained Schemes so that’s not unsurprising. It’s not a game for everyone and people who don’t really enjoy tactical games would do well to stay away, as BATTLETECH doesn’t hold your hand for very long. If you are willing to persist and forgive the duller moments of grind, then there's plenty of fun and memorable content to be enjoyed. You can get BATTLETECH and its first expansion on Humble Store, Steam and GOG. We originally said the Linux version was officially released as their emails said, but on release of the expansion and patch they're still saying it's a Beta. It does have a SteamOS icon on Steam and they say it's coming to GOG too (Humble gives a Steam key), along with bugfixes expected. Quote Linux Beta update: The Linux Beta along with fixes and updates has been integrated with the main game version and is available on Steam, GOG, and Humble! We've been fed a BETA instead of the proper release despite HBS promising us everything should be ready by the deadline. Oh, and the game is still listed as unavailable for Linux on GOG (which is understandable considering they shoved our way v1.21β). At the time of writing, it's not on GOG for GNU/Linux. Maybe it'll take a few days. Regardless, as I've said before, I'll be waiting for a big sale before I grab this. Will I grab it one day? Sure. But not at the current price - I've maintained that it's essentially less of a game for GNU/Linux users, having to miss out on so much multiplayer, pre-order content, etc. Maybe it does have more spit & polish now, but GNU/Linux users were left out in the cold from any feedback to that point as well. All _after_ it was more than fully funded for same day, or very soon after same day, release on GNU/Linux. So I most certainly have not changed my tune just because this has finally released (something I was actively doubting to be honest). I still despise that it even has a "season pass". That it has grind to keep you away from enjoying battles with Battlemechs is just...well, it defeats the purpose. But I'll reserve how I feel about that until the day I actually play it for myself. If there's ever a big enough sale to convince me to even give it a go. Linux is on the main branch. Localisation (and possibly a fix for the infinite loading screens on non US-desktops) is still Beta, but that is true for other OS as well. There's been some confusion on if it's actually a Beta or not. Their announcements to us, said it quite clearly that it was going to be released. It's possible they had last minute changes, but according to the Kickstarter update and this they both say it's an updated Beta. GOG does have a Linux build from what I've been shown, but it's outdated and not advertised on the store. We will do some adjustments to note this. Quote Flashpoint will launch next Tuesday, November 27, alongside a free update, adding a slew of new content, as well as Linux support on all distribution platforms! But to me, it reads as that the beta has been integrated into the main branch of the game, making it part of the main branch. They might feel that it's still experimental but we seem to have version parity with the other platforms now. I agree with Liam in changing the title of the article but as the game shows up on Steam with a SteamOS icon, I think it's safe to say that we've gotten official support as a platform. There may be a few lingering issues, though I can't say I've experienced any of them in my 40 or so hours with the game. As for GOG, it wouldn't be the first time that they took their time to provide Linux builds or patches of games as they typically test things themselves before pushing on their storefront. If it is feature complete, multiplayer works cross platform (maybe someone with a fast internet connection can confirm?) and the 2 known issues are the only abnormality then I'd say it is a good thing they consider it a Beta internally and continue improving it. BTRE As for GOG, it wouldn't be the first time that they took their time to provide Linux builds or patches of games as they typically test things themselves before pushing on their storefront. Nice joke! No, really nice one. I still remember their level of "testing" during "Pathfinder: Kingmaker" and "Pillars of Eternity II" launches. It's just not advertised and the version number on the installer is wrong. Yes GOG has it! Downloaded & installed! Anyone want to play, would be great to have some GoL Battletech multiplayer rounds!!!! J Anyone want to play, would be great to have some GoL Battletech multiplayer rounds!!! !